He wears corduroy trousers, a dark green jacket and a pinstripe shirt. A grey and white scarf is wrapped for warmth around his neck. He speaks softly but clearly and pauses often, choosing his words carefully as he sets forth his opinions. The thought crosses my mind that maybe the scarf also acts as a shield; his modesty and quiet demeanour are all too apparent. The man in question is David Mitchell. David Mitchell is a multiple award-winning British author and, a few weeks ago, I was fortunate enough to attend a BBC World Service recording of the World Book Club where he answered questions about his highly acclaimed novel, Cloud Atlas. An epic book spanning both past and future generations and encompassing 6 individual tales all subtlety entwined, Cloud Atlas examines society and the individual from numerous angles. Themes of reincarnation, prosperity and poverty, slavery and freedom and love and corruption lie within the pages of this intriguing book. It will catapult your emotions from laughter to sadness and even to utter despair. It is book which revels in the rich tapestries of life and, in the years to come, we may still be discovering new intricacies and hidden nuances. Cloud Atlas is an intellectually challenging book. The underlying themes are complex as is its use of language. The cycles of life are mirrored not just in the rebirth of the central characters and their interwoven stories but also in the use of syntax and vocabulary. The language moves from flowery 19th century American-English to early 20th century aristocratic English and on into mid to late 20th century American and English. It then shifts to a near futuristic society and language where nouns like “car” and “clock” have been replaced by brand names like “Ford” and “Rolex.” However, it is in the central story, Sloosha’s Crossin’ an’ Ev’rythin’ After, which is set in a post apocalyptic world, where the language becomes the most distant. It has developed, or perhaps degenerated, into a base, crude form which has its origins in the abbreviations and slang which are currently prevalent in texting, email and social networking sites. At this point the novel then revisits each story until it ends, as it began, with the 19th century language of The Pacific Journal of Adam Ewing. The whole linguistic process shadows Mitchell’s theme that as society becomes civilized its language develops in complexity and richness and as society degenerates it returns to a prosaic language of a barbaric and brutal world. Mitchell describes himself as something of a “nerd at heart.” It’s an interesting concept. For whilst Cloud Atlas is an extraordinarily clever and thought provoking novel, I’m inclined to believe Mitchell has taken his experimentation with language just a little too far. Maybe Mitchell isn’t a train spotting nerd or a computer nerd but he could well be a literary nerd. Of course, that’s not necessarily a bad asset when you’re as successful as David Mitchell but if the aim of the author is to communicate then in some respects I feel Cloud Atlas loses impact by overindulging in the use of language leaving the risk of readers being left periodically bemused and alienated. The use of accents and dialects in fiction is questionable at the best of times; all too often poorly written attempts at pastiche destroy otherwise creditable books. In contrast, Mitchell uses language with considerable thought and consummate skill but bizarrely it is this very accuracy which, on occasions, breaks the flow and absorption of the story; emotions and subtleties are lost and the reading becomes more of an endurance test than a pleasurable read. The novel may have won the Richard and Judy Best Read of the Year, an indicator of its popularity, yet somehow I can’t help feeling that Cloud Atlas has been over-hyped into the literary hall of fame. There may be many people with a copy of Cloud Atlas but, I wonder, how many have made it through to the end? How many copies sit partially read gathering dust whilst the owner turns the pages of Dan Brown or Patricia Cornwell? I don’t want to appear an intellectual snob so let me include myself amongst the potentially lost and alienated readers; it was a good twenty or thirty pages before I could read The Pacific Journal of Adam Ewing with relative ease. In addition, Sloosha’s Crossin’ an’ Ev’rythin’ After provided me with an even greater challenge. I had to read some sentences three times before getting a proper grasp of the meaning and even then on a few occasions I still failed. Perhaps the novel would have been more successful for me if Mitchell had just held back a fraction and given more a flavour of the language rather than the complete dish; language, like any tasty recipe, can be overindulged and when that happens the result can be indigestion. But whilst there were a few disappointments in Cloud Atlas I was still left with the overwhelming sense of having glimpsed the work of a truly gifted writer. In the most enjoyable stories where Mitchell’s description and characterization are at its best and where the stories don’t lose their sense of direction, one can only feast upon his writing. He has a delicious sense of humour too that wasn’t apparent in his BBC interview which, at times, had me laughing out loud. Indeed, I can picture him at his desk, chuckling at his own jokes, revelling in the writing of the flippant remarks of Robert Frobisher and the caustic witticisms of Timothy Cavendish. 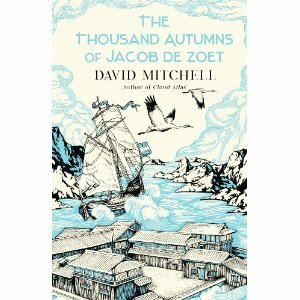 So having closed the final pages of Cloud Atlas I was sufficiently satisfied to embark upon Mitchell’s latest work The Thousand Autumns of Jacob de Zoet. The protagonist of the novel is a young clerk of the Dutch East India Company, who travels to Dejima, an artificial island in the bay of Nagasaki off the coast of Japan, with the aim of establishing his credentials before returning to the Netherlands to marry his sweetheart. Of course what Jacob finds isn’t an easy ticket to prosperity but an island riddled with corruption, inhabited by predatory Dutchmen, an assortment of slaves, a bad tempered doctor and other social miscreants, each with their own fascinating histories. And if that isn’t enough to whet your appetite throw in clashes with the ancient culture of the Japanese, a scarred yet beautiful midwife with whom to fall in love, a nunnery, murder, hara-kiri and a pompous old British naval captain and you have a historical pot-boiler. Frankly, I simply delighted in the The Thousand Autumns of Jacob de Zoet. Unfortunately, I have to admit to being a bit of my nerd myself and having studied European imperialism and naval history, albeit from a slightly earlier period, a novel about boats, breeches and Dutch bores was right up my slipway. No wonder the Dutch sell tulips these days; it took poor Jacob 18 years to return to the Netherlands instead of the 5 years he’d anticipated. Now there’s a lesson in business; trade something that can be sold anywhere and which you don’t have to sail half way round the world to flog. Lesson learnt eh Jacob? On a more serious note, whilst Mitchell revisits some of the themes of Cloud Atlas, in particular slavery and oppression, this novel is much more conventional in its approach to story telling. The language is still written in the style of the period but I felt it had been tempered and bar a few isolated incidents it didn’t present me with any difficulties; the flavour of the period and the cultural differences are still so clearly and cleverly portrayed. Mitchell is, without doubt, a master of words and whilst the novel isn’t perfect and the occasional staccato description was a source of irritation I see this novel as the opening of new boundaries for David Mitchell. I’m sure Mitchell is still an author in progress. As much as Cloud Atlas was an experiment in structure and language so is The Thousand Autumns of Jacob de Zoet. It might be a novel which has a more traditional appeal to the average reader but for Mitchell it marks an entirely new direction. Unlike many authors trapped in the success of their breakout novel Mitchell goes where others fear to tread; he will go any time, any place, any where. His forays into style, structure, language and literacy are all wrapped in wondrous tales which resonate with the beating heart; from the agonies of love and loss and the joy of laughter, to the horrors of enslavement and the depravity of decayed civilizations. Whilst I don’t think Mitchell has yet reached his zenith with The Thousand Autumns of Jacob de Zoet it is another huge step forward. It’s more likely, at some point, all Mitchell’s knowledge and learning will be amalgamated into a novel which will rise beyond the experimental outings of Cloud Atlas and The Thousand Autumns of Jacob de Zoet and that will be the novel that truly justifies his many accolades. When I look back at the great writers, the ones whose names spring to mind at a moment’s notice, like Dickens, Austen and Shakespeare, they were all writing in the language and style of their period. Whilst Shakespeare’s plays were obviously shaped by the needs of a dramatist and the need to keep his head, in many ways he too also wrote, not just in the style of his era, but about the society in which he lived, as did Austen and Dickens. I can only imagine how scrumptious a novel by Mitchell might be should he examine the peculiarities of the British psyche, our multi racial society and our fondness for jokes about flatulence. Imagine a 21st century Robert Frobisher or a Timothy Cavendish or a Captain John Penhaligon? How utterly thrilling! And all those characters, all those British societal quirks, are still out there just waiting for a man with a gift like Mitchell. So hurry up and dip your quill Mr Mitchell, turn up your lamp, and scribe the work of genius that awaits you; I don’t want to wait a thousand autumns. The BBC World Service Book Club is an international book club broadcasting interviews with some of the world's greatest writers. 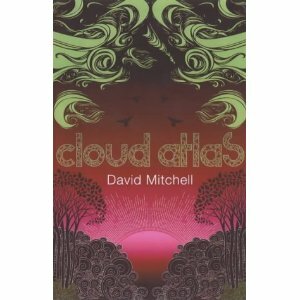 David Mitchell can be heard discussing Cloud Atlas on June 5th. To find out when the show is broadcast in your area follow the links on their website here. They are also currently inviting questions for Carlos Ruiz Zafon, the author of the best selling Shadow of the Wind which can be submitted via their website by June 3rd. I've read all of Mitchell's books except for his latest, and I really admire the way he uses language, or the lack thereof, to convey reality. I found the last few pages of Cloud Atlas absolutely stunning, its clear that the writer was on song when he wrote it. I wonder if you would like Black Swan Green. It's superficially the most conventional of all his novels till date, but the very concept of that book is on the limitations of language and the structure of emotion, principally the former. It's also far more bitter than anything he ever wrote before.